So you think you know Souq Waqif better than us? Let's see if you can get yourself around these 9 clues hidden in the souq and win yourself a Desert Safari, a Kayaking tour or a dhow cruise! 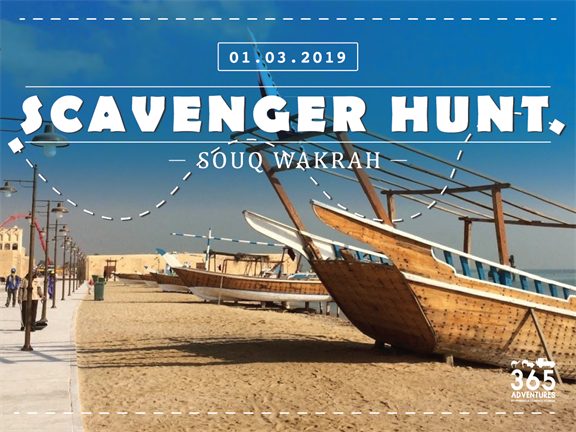 Sign yourself up or your team & Explore Souq Waqif like never before with our 365 Souq Al Wakra Hunt. - Competitors would look for a clue with a riddle on it and locate their next location with the riddle. -Volunteers will be scattered in various locations of the souq to guide the player/teams for their next clue. -Players or teams with all the clues wins the Souq Hunt. - A full-on four hours desert safari for 6 people. - Free voucher for any 365 adventures event. - Kayaking for 2 at the mangroves.